Fly Fishing is what we are about, we take pride in our personal approach to all things, be it a guided trip, lesson, school, or class. If your desire is to learn from someone whose passion is to teach, then I can help! Our customers are our friends, and we are passionate about what we do. Everything we do is results oriented, and that’s largely why folks come here…….we get results. We are the Piedmont and Foothill’s only Full Time Professional Fly Fishing Guide Service, we focus all our passion Fly Fishing……and nothing else. It’s a passion!!!!! And we’ve been doing it longer than any current running Guide Service in our area today. In one form or another, I have been working with, guiding fly fishing, teaching fly fishing, fly casting, and fly tying for over 27 years. Whether you want to fish hard or just relax and fish leisurely and decompress on the water, then I will treat you to a great day on the water. I’ll share with you fishing tactics, rigging methods, reading water, selecting flies, and more, including knowledge about the local area to give you a better understanding of how you fish, the techniques I use, and the things you’ll need to do to be successful on your own. So Why Hire a Guide Anyway? -I know what the fish are feeding on, how to imitate those food items, how to rig your leader, fly, and terminal tackle in such a way that we effectively imitate what the fish are eating. From that you’ll gain ideas on how to rig your stuff on your own the next time you fish on your own. -From over 27 yrs of selling flies, designing flies, tying flies, I know what to look for and what is important and what is not so important. Flies and sharing fly knowledge is a big part of what I do and what I enjoy. Many guide trip clients are fly tyers as well and in a day’s fishing they’ll pick up a new pattern or two and get some new tying ideas. And if they don’t tie, perhaps they’ll be inspired to begin. I take my flies seriously, and so do to others; I not only tie and fish my own stuff, I tie flies for and sell flies to many other guides here in our area as well. -Folks usually find that on a trip with me they’ll catch fish, multiple fish, and so on. From beginner to expert we strive to exceed expectations, and the comments “that’s the best day I have ever had in numbers of fish” or “that’s the biggest fish I have ever caught” are what we often hear. 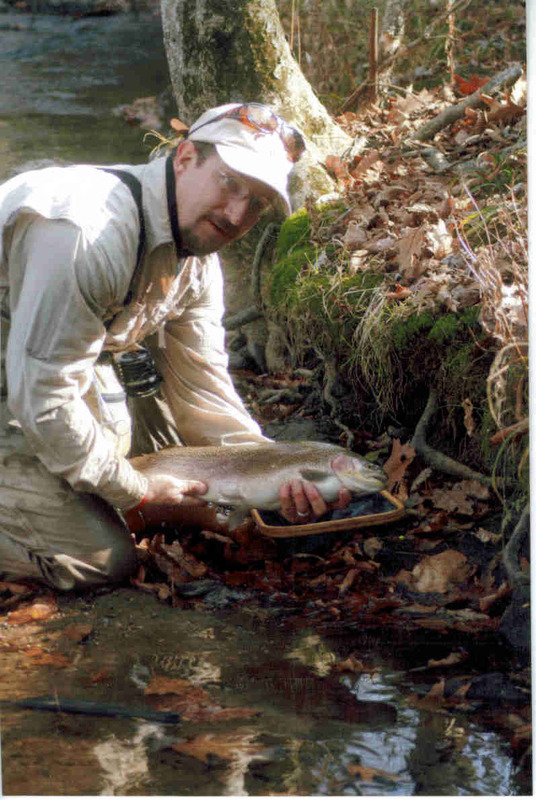 During the 2011-2012 seasons alone we have registered over 150 citation sized catches with the NC Wildlife Resources Commission that were caught by clients- – and many of these folks were new anglers – – some of which it was their first day fly fishing. We want folks to start off with a bang…and a huge fish or catching a lot of fish will do wonders for that. -I will do everything I can to enhance the fishing experience in every way. -I will teach you new techniques and help you with any problems you may have. -I will put you on the most productive water at the most productive time. -I will give you a wealth of local knowledge about the water and the fishing available there. -We will enjoy great company and fellowship…..and laugh and enjoy ourselves and forget “stress and work” for a while. -If you are a skilled angler and you have a person you are bringing- -such as your son or daughter, spouse, co-worker, family member, etc, I will make it possible for you to fish and enjoy yourself, all while not having to play “teacher” or “guide” for the person you bring. You’ll get to enjoy your day catching fish and also enjoy watching them do that as well…..and you are free to FISH in PEACE and not spend your day UNTANGLING stuff. -When the day is over I will thank you and invite you to come again, as well as provide you some photos and video clips to serve as a momento of your day……and we take those seriously. I am equally as passionate about photography as I am the fishing… and committed to doing all necessary to provide good photos so you are free to enjoy your day and focus on fishing……….So Lets go fishing! Half Day and Full Day Trips….What can I expect? Half day trips are intended as an option for those with limited time or who are not able to do a full day trip. 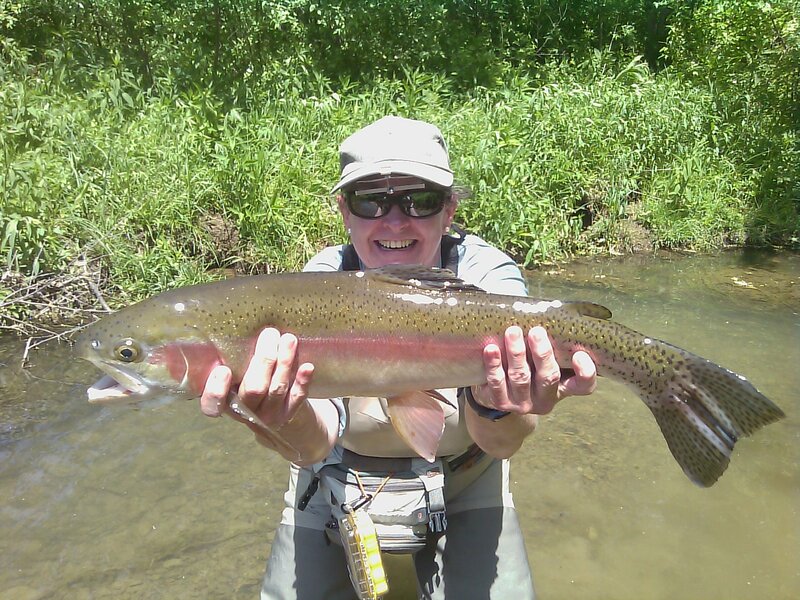 Half day trips typically mean 4-5 hrs of fishing time, and they offer a great opportunity to sample some of the fishing available…particularly during the summer when the dry flies…especially terrestrials….can be red hot. Full Day trips are about 7-8 hours of fishing. Normally we adjust the time of day we’ll be fishing according to when its best to be on the water. We provide the flies we will use on all trips unless a customer desires to use their own. We also include as a part of your half or full day trip a collection of post trip photos you can download – – or per your request a CD w/ high quality photos and video clips of your day of fishing with us, so you are free to relax and focus on the fishing. Lunch is normally provided on full day trips only. We reserve the right or call to cancel a trip if inclement weather presents bad conditions or dangerous traveling conditions affecting safe travel to or fishing at our destination. We do however, fish in the rain and snow. Normal rain, and in season snow, are normal conditions and fishing normally can be very good, even excellent, which is why we usually do not cancel trips due to rain/snow. In fact, a cancellation normally prevents us from rebooking – -and we have a lot of customers who do not mind fishing in the rain/snow. For that reason we usually are on ‘go’ with a trip if the weather system appears to be reasonable. Even high, murky water conditions produce good fishing- – -it is under those conditions that big fish go on the hunt and eat something. Our clients registered almost four dozen citation sized trout, that is fish of 20 inches or better this past winter and early spring season, and the majority of them were caught in slightly up to even high, murky water conditions. Often what folks deem as “less than favorable” conditions are actually a golden opportunity- – -a missed opportunity to catch fish and sometimes trophy fish. One advantage is the extra water covers up casting mistakes and they also can’t see the line, leader/tippet as easily. Trout ‘n ‘ Bass Combo – we’ll spend the early morning hours til around noon fishing for one of my personal favorites, smallmouth bass. We’ll catch what many call a “bobcat with fins”, or the “fightingest fish in fresh water, pound for pound.” It won’t take but a few seconds hooked to a large smallie to agree with that statement. We’ll have lunch, then head to some hike in brookie fishing in which we’ll be fishing for wild rainbows and brookies in a wilderness setting. A great way to learn fishing techniques for the challenging late summer conditions that many folks find on their favorite waters. Also, one option during the summertime is to do early morning terrestrial fishing for trout, followed by some afternoon fishing for smallmouth. The point is we have you on the water at the best time to do well. We currently have available to us almost 14 miles of private water spanning several streams in Virginia, from a small spring creek with large fish to water nearly the size of the upper Smith River in Virginia. Quality fish abound here with a good majority of the fish over 15 inches, and a 20 inch fish every trip is almost a given. A couple of the waters have fish up to 5-10lbs, and two of them have fish up to 15lbs. 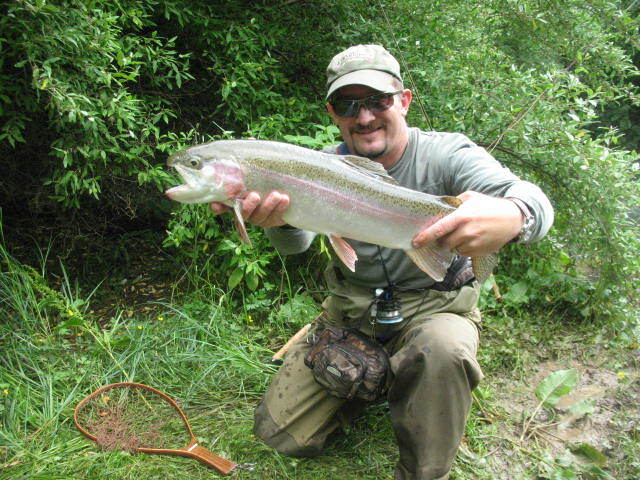 In the fall we’ll be adding another location that has a section of river with a handful of rainbows exceeding 20lbs. Please contact us about availability and to inquire about reserving a day on these high quality waters. On site lodging available on some waters and nearby lodging available on the others. Can be combined with some of our other trips as well. If you are interested in finding out more give us a call at 336 944-3628 or an email here . Diane Bertrand (left) and Brian Donley (right) each with some true leviathan sized rainbows……what a hoot! I have enjoyed fishing for and guiding for smallmouth for the better part of 21 years, and fishing for them for more than 25 years, and we aren’t a guide service who “happens to do a few smallmouth trips here and there.” Summer smallmouth fly and light tackle trips are some of our favorites, for many smallmouths fill the late summer dog days void of picky trout and low, clear water conditions that often leave “trout bums” waiting for the cooler, wetter, days of fall. But this fishing isn’t a “plan B” thing in our opinion. 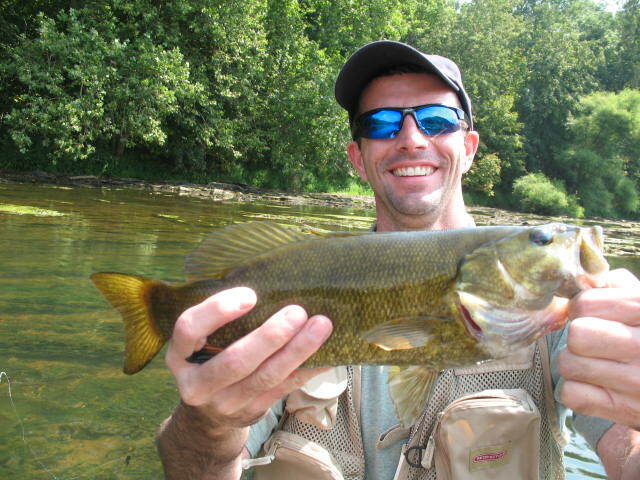 smallmouth bass are great fish and are much stronger fighters than any other fish in freshwater. They also are quite challenging and cagey, and in clear water can be as much of a challenge as any trout. I can show you how to read water, locate fish, rig properly, choose the right fly pattern, make effective presentations, and be successful under a wide range of conditions. 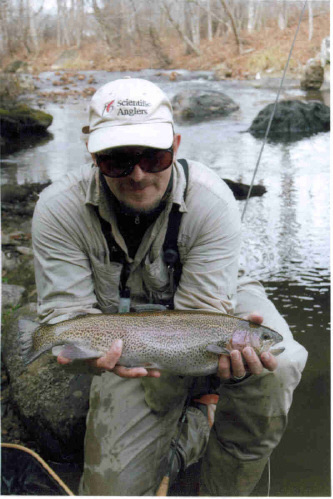 We offer fishing both the NC and VA side of the New River and a host of other smaller waters. Our trips are wade trips and we offer half day, full day, and DTD trips. 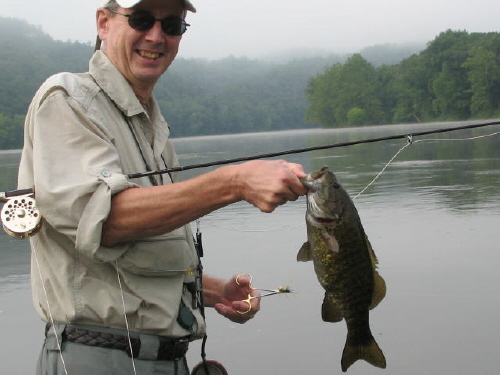 Half day trips are about 4-5hrs fishing, full days are 7-8 hrs fishing, and “DTD” (dawn til’ dusk) trips are sunup til sundown offering two low light periods of fishing when the likelihood of catching a trophy smallmouth are greater on a fly. On all trips we provide water and beverages. Full Day trips we provide lunch, DTD trips we provide lunch and dinner. Our favorite method for catching them is on top. These trips have become one of our most popular and the 2007 and 2008 seasons have been exceptional ones with several trophy fish landed by our clients, many of the fish have earned our clients trophy award citations by the state of VA. Pictured is Bart Manning of Greensboro, NC with a 2.5lb smallmouth caught on the surface on a popping bug on July 23, 2008. Half day trips are intended as an option for those with limited time or who are not able to do a full day trip. Half day trips typically mean 4-5 hrs of fishing time, and they offer a great opportunity to sample some of the fishing available…particularly during the summer when the dry flies…especially terrestrials….can be red hot. Full Day trips are about 7-8 hours of fishing, and include lunch. It’s long been said that if you can fish and catch fish consistently on the Smith, you can catch them anywhere. Its true, and the river’s wild brown trout are great fish for training you to fish western rivers,particularly spring creeks consistently. If the technical nature of the river has frustrated you, let me show you how to catch fish on this wonderful tailwater river. Virginia’s Best Brown Trout Stream! Small Stream trips and Delayed Harvest trips are fun for beginner and experienced fishermen alike. Some of the areas we fish we hike into, some are readily accessible public waters. But nearly all offer some great fishing, and an opportunity to polish techniques or maybe learn some new tricks. 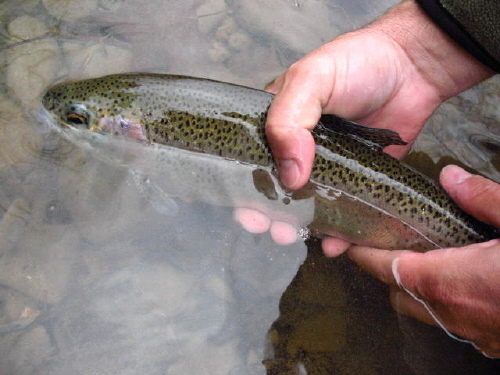 We fish small to medium wild streams throughout the NW to North Central NC Mountains. and also the DH streams. We also fish year round, even in Winter . In fact, winter is one of our favorite seasons! Winter is a great time to catch large fish too like this one (Anthony V. Smith News & Record Photo). We also have access to some high quality private waters that offer an opportunity to escape from the crowds and enjoy catching very nice fish, often much larger than average amidst some beautiful surroundings. These trips can be done as a day trip or overnight depending upon time of the year. For more information please contact us here . We currently have available trips to Escatawba Farms located in Virginia. We can suggest lodging for those wishing to make this trip an overnight one. We do wade trips on the South Holston and Watauga Rivers as well. Single day or multiple day trips are available for those wishing to sample the best of what these two western-like rivers have to offer. One essentially fishes like a large spring creek, the other like one of the big, brawling freestone streams of the west. One day trips are full day only, multiple day trips we can do one full day plus a half day, or two days too at the customer’s discretion. While the majority of our trips here are day trips, many of our customers require lodging for this trip and we’d be happy to take care of that for you as well. We have a number of lodging options from near the river to on the water with fishing right out your doorstep. Our Tailwater Guide Service we are especially passionate about and like our other trips you will find our knowledge and expertise with regard to them as good as you will find….. 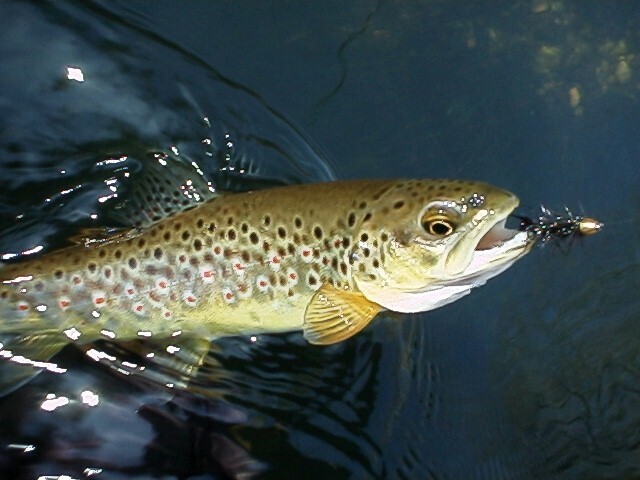 The South Holston is my personal favorite and I know it well and would love to show you an enjoyable day on what many consider (and rightfully so) one of the top 3 trout rivers in the East.